There are few things more interesting in my life than my time spent in our national air space. From broken loading gates to ear infections, arriving on time with our luggage intact has become the exception. My recent jaunt to Detroit stands as one more example of the type of luck I have with airlines. So I spent the last week in the suburbs of Detroit. 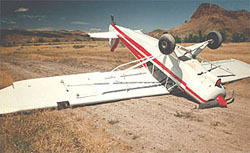 While the trip itself was uneventful, we, as always, had issues flying. My wife and I have discussed this in depth, and we honestly feel we have a legitimate curse when it comes to air travel. Since we live in the glamorous star-studded hills of eastern Kansas, and our family lives anywhere else, we often find ourselves prowling national air space en route to more civilized destinations. Like our time in Detroit, the trips themselves are fairly routine. But when it comes to airplanes, well let’s just say our luck must pose some sort of minor security threat. In going to Detroit, the incoming plane from wherever broke down in the connecting airport. Northwest had to fly an empty plane from Indianapolis to pick us up. On our way back from Detroit, we boarded on time and were about to pull away from the gate when the interior cabin lights flashed a couple times. The pilot prompty announced a “computer screen” had failed and they had to replace the part as we sat there. Returning from a conference in San Francisco, I was delayed in Oakland for five hours. When landing in Philadelphia, we pulled up to the gate only to have the gate door malfunction and refuse to open. The pilot had to drive around the terminal looking for an unoccupied gate. When I flew to Italy the airline lost my luggage. I spent the first four days of my ten day trip in the same clothes before the bags finally caught up to me in Rome. Last Christmas, US Airways lost our luggage both ways. On my way back from Boston, the plane literally broke down on the runway right before takeoff and had to be towed back to the terminal. It was the last flight of the day and I had to stay overnight in a Marriot. Then of course there was the The US Airways Abattoir of Suffering. Nothing like a North Carolina Ramada to warm the weary traveller. One time when landing, the air pressure in the cabin was screwy, and despite concentrated gum-chewing and swallowing, I could not get my ears to pop. The pressure in my head kept increasing until I was literally bent over in pain. Finally, my right ear audibly popped — loud enough where my wife looked at me in disbelief because she actually heard my eardrum go “pop” over the din of the plane landing. My left ear never popped and I ended up getting an infection. The light flicker is probably due to a quick reboot of the plane’s power system. Just as when you call Dell – the first reponse to any electrical error on the plane is to kill all power and bring it back up.